Our Brazilian Jiu Jitsu adult program is open to all ages and skill levels. The Gentle Art, as it is often described, is a non-striking martial art that utilizes grips and leverage to unbalance your opponent and ultimately achieve a submission, or "the tap". A typical class is divided into two parts: technique and drilling, followed up with live sparring. Both are invaluable to learn and retain proper technique, while developing sensitivity and timing through live sparring. We have a diverse student body of all skill levels and hailing from all walks of life. We are unified, however, on core values and edicts. 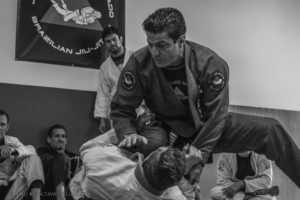 Classes are taught on a rotating schedule between Master Jean Jacques Machado and Professor Jay Zeballos. 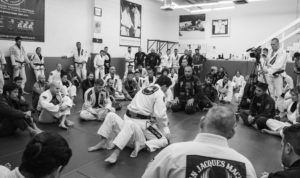 The Jean Jacques Machado Kid's/Youth Program provides a structured, safe and supportive learning environment for children (*Kids 7-12) (*Teens 13-16) who want to learn the art of Brazilian Jiu-Jitsu. Classes are high energy and fast paced to ensure students remain focused and most of all have fun. 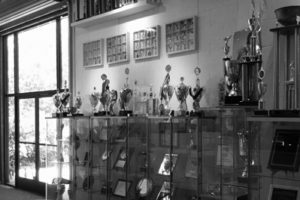 Our goal is to empower your children with the attributes and technical abilities of a Brazilian Jiu Jitsu practitioner, while at the same time instilling the respect and responsibility that comes with acquiring such skills. We take great pride in providing not one, but two experienced 3rd degree Black Belt instructors for our Youth Program. All classes are conducted under the direct supervision of Professors Jay Zeballos and Mark Armstrong , assisted by Coaches Manny Saenz and Christopher Martinez. Ages are only to be used as a guide. Instructors and Master Jean Jacques Machado make final decisions as to individual student levels. Please contact us for more information. Private lessons available by request and are based on instructor availability.